A 22-year-old man was reportedly shot, beaten and robbed at the Savannah Springs Apartments in Jacksonville Friday afternoon, August 14, 2015. 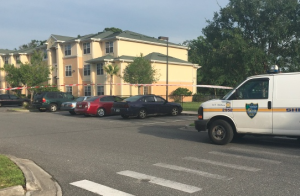 According to The Florida Times Union, “three men approached the victim about 4:30 p.m. in a hallway in the back of the Savannah Springs apartment complex at 6945 Morse Ave.” The “22-year-old man was shot in the stomach, then beaten and robbed by three men.” Per media reports, the victim attempted to run away, but the suspects chased him across the apartment complex parking lot. After committing the crime, the suspects apparently fled the scene in a small gray vehicle. The victim was transported to the hospital for emergency care, and his current condition has not been released. This is apparently not the first incidence of violence on property. Jacksonville.com reports that a shooting occured in the apartment complex parking lot in May 2015. As police continue to search for suspects, and in light of the prior reports of gunfire, The Murray Law Firm is questioning whether a potential apartment security lapse may hold some responsibility in this shooting. How did the assailants gain entry to the apartment complex? What property access-controls and parking lot security measures, such as gated-entry, fencing, security patrols, bright lighting, and surveillance cameras, were in place to deter crime at the time of the shooting? By law, apartment owners are required to protect all residents and guests legally on the premises from any foreseeable harm. Should the facts of this matter reveal that the apartment complex owner or management company failed to provide adequate security to protect those on its premises, the victim or the victim’s family may elect to pursue a legal claim for his injuries. Under such a claim, the victim or his family may be entitled to substantial compensation.